Quirky, the company that acts as a crowdsourced product development platform, has raised a $79 million Series D round of financing with $30 million of that coming from GE(s ge). The round also includes current Quirky investors Andreessen Horowitz, Norwest Venture Partners, RRE and Kleiner Perkins Caufield & Byers. In addition to the financing, GE and Quirky also just expanded a connected home gadgets partnership they began in April. The goal is to build 30 devices together over the next five years. 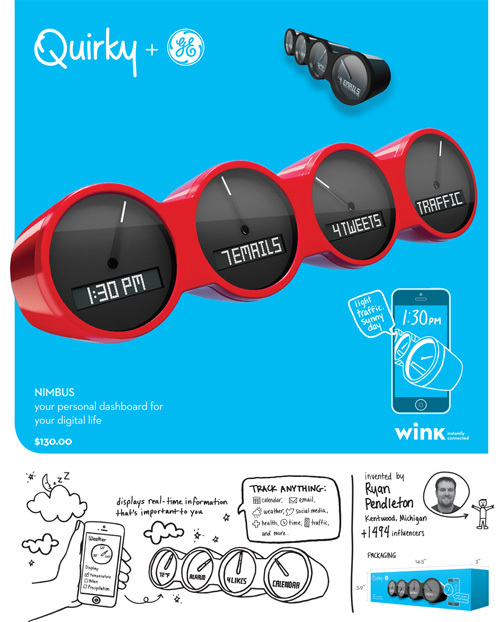 So far that partnership has resulted in the launch of four devices, including a connected egg tray that seems to have come in way over the anticipated cost, and the Wink app that will control the GE/Quirky devices. Today the two companies announced that those devices will be available in the Home Depot and other major retailers in time for the holidays. This is big news for the space as it represents yet another platform play in the consumer internet of things market, and one geared toward openness. Last August, I spoke with Bret Kovacs, the man in charge of this partnership a few months back as part of our internet of things podcast, and he told me that the partnership’s goal is to build a series of connected devices that are all controlled by the Wink app. The financing will help Quirky continue to expand its investment in connected home products, and represents a second front in GE’s connected devices strategy. The enterprise front — what GE calls the industrial internet — has seen GE invest in a San Ramon, Calif.-based software center that employs 800 people and $105 million in Pivotal, a spin-off of EMC(s emc) and VMWare(s vmw). And while the industrial side of the internet of things already exists, and will lead enterprises to buy more software and services to extract data from their machines and business processes in order to optimize them, the consumer internet of things is much more fragmented. I find the Quirky/GE strategy pretty interesting because it’s bringing in some truly new products, such as the connected egg tray, a smartly designed, connected outlet with four slots, and a clock that shows your time, tweets and emails. However, given that the cost of the egg tray is set at $70 and the original estimates for the cost of the egg tray were $14 at first, and then about $25 when I did my podcast with Kovacs, it seems the cost of production and getting these devices online may be more than GE/Quirky anticipated. I think it’s probably too high for a connected egg tray as well. Unless GE wants to incorporate that design into its refrigerators as a way if both hiding the cost and driving it down. All these are controlled via the Wink app, and GE/Quirky wants to open the Wink app up to control any and all devices from other platforms. The GE/Quirky products will go on sale in Home Depot(s hd), putting it up against Lowe’s(s low) own closed Iris hub and connected device system as well as an effort by Staples(s stpl) to bring in a wide variety of connected devices via its own hub and app offering. This effort is fundamentally different because the devices use Wi-Fi and connected to the Wink app, but there isn’t a hub that will connect devices that use other radios. Ben Kaufman, Founder and CEO of Quirky was quoted in the press release as saying that in the last six months the combined Quirky/GE effort has created a $45 million connected consumer business. In contrast, last month Bill Ruh, vice president of GE’s software and analytics center, said that so far this year GE’s industrial internet products have contributed $290 million in revenue for the company and it has booked $400 million. So even if the consumer and enterprise internet of things efforts never merge, GE, via this Quirky partnership, now has a stake in both. I can’t wait to see what they add next.